The first Baron of Wolverton appears in the Domesday Book as Maino le Brito – Manno the Breton. This tells us that he came from Brittany, as did many of Duke William’s supporters, and he was rewarded with extensive estates in Buckinghamshire, Northamptonshire and Leicestershire, and a little corner of Hertfordshire. He established the centre of his barony in Wolverton and built a castle there, and the mound on which the keep was built is still visible. We do not know very much about him but thanks to Maurice Hammond, who has just written to me, we know a little more. Manno was apparently the lord of Ercé en Lamée, south of Rennes in Brittany. He was a powerful lord in his own right and fully able to assemble a fighting force to accompany him when invading England in 1066. Maurice has also unearthed another story, that Manno had two sons, Hamo and Gauter, who contracted leprosy. Thankfully, according to this story, they were healed. This little anecdote may also fill in another gap in our knowledge. Manno’s successor as Baron of Wolverton was Meinfelin, and as far as we can estimate came into the estates in 1114, presumably after the death of Manno. Meinfelin lived to 1155 so it has always appeared to me that there was a rising generation and that Meindelin was a grandson of Manno and not a son. Now Manno had at least two sons that we now know about, Hamo was probably the eldest. If he was cured of leprosy and went on to have children then it is possible that Meinfelin was his son. Meinfelin’s son, probably the eldest, was named Hamon, or Hamo, and we can assume after his grandfather since this was conventional practice. It also occurs to me that Meinfelin might have been named after his grandfather, Maino and at some time acquired a nickname – “Maino le Felin” (Manno the Cat). The name stuck, as nicknames tended to in an age before surnames, and in time was contracted to Meinfelin. 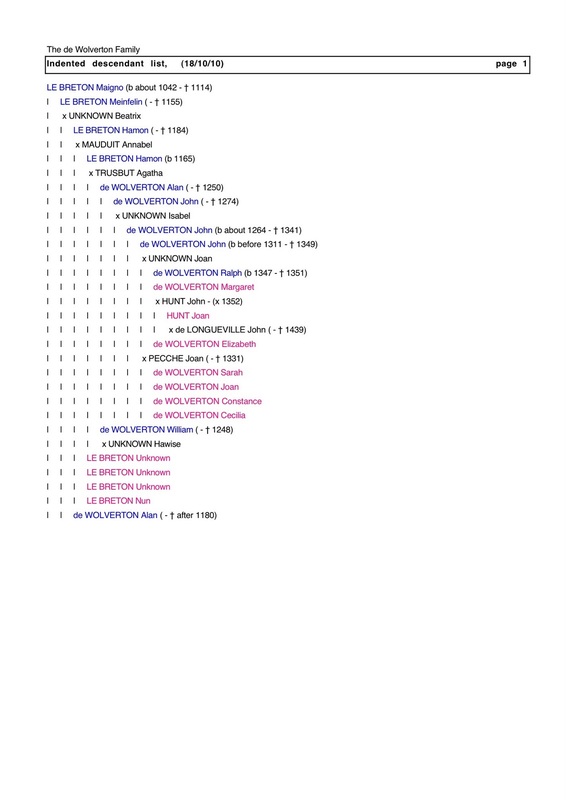 I outlined the first 6 generations from the Breton Baron who established Wolverton as the centre of his power here. This post continues the story. The third Hamon, who probably died around 1198, had three sons who inherited the estates and the title: Hamon, d. 1211, William d. 1246, and Alan d. 1248. Alan was the first to style himself de Wolverton and he was the only one with a male heir, John, who lived to 1274. His son, Sir John de Wolverton, succeeded to the title as a minor. He appears to have been an uncooperative character, at least as far as the crown was concerned, and from the standpoint of history his accession marks the beginning of a slow decline in the de Wolverton fortunes. In 1284, as he was a minor and a ward of the crown, Queen Eleanor chose a bride for him. He refused to marry her. In 1297 he was required to undertake military service overseas. He declined and paid a fine. In 1328 he argued for exemption from the Assize and in 1342 it is suggested that he had not been fulfilling his service duties at Northampton Castle. He was the last of the de Wolvertons to be summoned to Parliament and it seems that the Barony died with him. He died in 1342 and his son John succeeded to the estates but not the dignity of Baron. This John had four daughters by his first marriage and two daughters and a son, Ralph, by his second marriage. When John died in 1349 (the date would suggest death from the Bubonic Plague) Ralph was only two years old. Ralph did not last long and died in 1351 and at this point it becomes complicated. The Chalfont portion of the Barony appears to have been divided between the daughters of the first marriage. The lands in North Bucks, including Wolverton Manor, were divided, after the death of Ralph, between the two daughters of the second marriage, Margery and Elizabeth. Margery and married John de Hunte of Fenny Stratford and the had one daughter, Joan, who became the heir. She married John de Longueville of Little Billing and when the dust settled after the early deaths of other possible male heirs, it was John de Longueville who ended up with the Wolverton Manor in 1427. Thus the male de Wolverton line came to an end. I have written briefly about the Breton Lord who became one of William’s tenants-in-chief after the conquest. Here is a more detailed review of his landholdings. After 1066 Wolverton came to be a centre of increased importance. This was solely due to the man who established the seat of his barony there, Mainou the Breton. Of his person and his origins we know nothing. We do not even know very much about his life, but we do, from the Domesday Survey of 1086, know quite a lot about his landholdings. From this we can draw certain inferences about his importance. After the Conquest he was given quite extensive landholdings in Leicestershire, Northamptonshire, Hertfordshire and Buckinghamshire – mainly in the last-named County. While he was not in the same rank as the magnates close to William who were given huge landholdings, he was certainly in the second rank. Altogether he held sway over 127 hides and taking as a rough guide a hide to be about 120 acres, this gave him total landholdings of over 15,000 acres. The most valuable portion was the Manor of Wolverton, which was valued at £20 and it was possibly for this reason that he chose to settle there. A good part of his landholdings were also in North Buckinghamshire, so the location may also have been practical for administrative purposes. Not too far away, he held the manors of Loughton, Stoke Hammond, Thornborough and Padbury which amounted to well over half of his land. Beyond that he held the manor of Ellesborough near Aylesbury some scattered small manors at Aston Sandford, Chalfont St Giles, Drayton Beauchamp, Helsthorpe and Lamport. Neither Helsthorpe nor Lamport are recognized as places today. Helsthorpe preserves its name as a farmhouse near Wingrave and Lamport, probably part of Water Stratford, ceased to exist long ago. Mainou also held a sizeable but not too valuable manor at Lutterworth and two small manors at Misterton and Catthorpe in Leicestershire. The Lutterworth Manor supported 6 villagers and 7 smallholders and 12 of these were Freemen – that is they were able to work the land without any obligation of service. It appears that the lord’s demesne was operated by 2 male slaves and 1 female slave. The value of this manor was £7, some of which was owed to the King, so it may not have been a great source of revenue for Mainou. The same could be said for Misterton and Catthorpe which were only valued at 20s each. Since we hear no more about these properties in connection with the Wolverton barony it is fair to assume that Mainou or his son dispensed with them. One may make similar observations about the Northamptonshire properties. There was one hide held from the King at Thenford, near Banbury, 3 virgates at Wicken and something over 4 hides at Maidwell, north of Northampton. Each was valued at £2. The demesne in each manor was worked by slaves, a mode of operation which may have become obsolete by the end of the 11th century. The last piece of land, ”the third part of ½ hide in Dunsley”, which is part of Tring, was valued at only 12d and provided sufficient land for 1 ox. In later years we have records of only the main Buckinghamshire holdings so it would appear that these peripheral interest were traded off in favour of lands closer to home. There was in any case much work to be done in Buckinghamshire. In the immediate aftermath of the battle at Hastings, William and his army moved north, crossing the River Thames at Wallingford and thence into Buckinghamshire where there was a lot of harrying and laying waste of the countryside. The Domesday records betray the impact of this policy. Ellesborough: Total value £6; when acquired £4; before 1066 £10. Chalfont: Total value £6 10s; when acquired 100s; before 1066 £6 10s. Aston: in total, value 100s; when acquired £4; before 1066, 100s. Helsthorpe: Value 40s; when acquired 20s; before 1066 £4. Drayton: In total, the value is and was £4; before 1066, 100s. Lamport: In total, value 30s; when acquired 16s; before 1066, 30s. Padbury: Total value £12; when acquired £7; before 1066, £12. Stoke: The value is and always was £10. Loughton: the total value is and was £3; before 1066 £4. Wolverton: Total value £20; when acquired £15; before 1066 £20. Drayton and Stoke may have escaped burning and looting but it would appear from the dramatic drop in value of Helsthorpe and its partial recovery 20 years later, that the devastation in 1066 was complete. The rest of the manors had recovered their value after 20 years, although Ellesborough was apparently struggling to get back to its pre-Conquest valuation. The 1086 survey shows us how Mainou managed his dispeserd holdings. Some were given over to his knights in a practice later termed subinfeudation. In these cases a manor was given to a knight who would enjoy the revenue in return for military service. In this way Mainou was able to fulfil his own obligation to the king. In Chalfont, which must have been largely wooded at the time, he installed two knights, one in the area known as the Vache and another at Isenhampstead, later known as Chenies. The Red Book of the Exchequer of 1186 records the names of those knights in the assessment of Hamon’s 15 knight’s fees. Among them, descendants presumably of Mainou’s knights, are Alexander de Ysenhamstede and Warnerus de Vacca. The Vache, which may have acquired its name as a cow pasture, was adopted as a surname by this family and the de la Vache prospered for a few hundred years. Isenhampstead is not mentioned in Domesday but we can infer from the knight’s fee of 1166 that it was part of the Chalfont Manor. By 1232 the family name was Cheyne, probably through marriage, and this family prospered there for 300 years, giving their name to the manor and the parish as Chenies. Mannou had granted the Drayton and Helesthorpe manors to Helgot and there may have been the expectation of more than one knight coming out of this arrangement. The 1186 list records Peverel de Bello Campo for two knights and Stephanus de Bello Campo for one knight. They may have been descendants of Helgot and had adopted the name Bello Campo – Beauchamp, which later attached itself to the manor and parish of Drayton. The now non-existent Lamport, near Stowe, was also subinfeudated to Gerard and Berner was given the quite large manor of Thornborough as well as Maidwell in Northamptonshire. Two men at arms were given Loughton and later the de Loughton family emerges from one of these. Mannou’s knightly obligations could thus be met by two from Chalfont, two from Drayton, one from Helesthorpe, one from Lamport, two from Loughton, two from Thornborough, one from Maidwell, with the other four supplied from his own holdings including himself. The barony of Wolverton was assessed at 15 knight’s fees, Wolverton Manor probably contributing two of those. To understand what this meant we have to translate ourselves into another age with vastly different values from our own. Medieval society was divided into three estates – those who fight, those who pray and those who work. The fighters, the aristocracy, included the king, the earls and barons and the knights and esquires. The church also had its hierarchy with bishops and abbots at the top with humble monks, friars and parish priests at the base of the pyramid. The workers, who supported the activities of the other two estates included merchants and peasant. The peasantry, in an agricultural society, staffed the engine room of the economy. In William’s time there were about 50 tenants-in-chief and between them they could raise an army of about 5000 knights. Knights were expensive. The armour might cost £10 and a good war horse might cost up to £40. On top of this the knight would need to support himself and his family in suitable style so it would require the labour of a large number of peasants to support a single knight, let alone esquires, who were in a sense apprentice knights. All of this was at the cost of Mainou and sometimes this could be quite a heavy burden, so as in all things economic, this led to a practice known as subinfeudation, whereby the tenant-in-chief would hand over a manor to a knight in return for his required service. This, for example, is exactly what happened in the Manor of Aston, valued, a we have seen, at 4 ½ hides worth £5. In 1086 Odo held it from Mainou in lieu of service and it appears that his descendants adopted the name of Sandford. In time, as these feudal practices changed, first by excusing themselves from military service by a fine and by the 14th century seeking and expecting payment for military service, these small manors became customary holdings for the men whose ancestors once held them in lieu of service. As I said at the outset we know nothing of Mainou’s life. We do not know where in Brittany he was born, nor his parentage, nor his wife and children. These pages are blank. It is possible to infer that at the time of the conquest he was in his twenties at least and that he might have been born circa 1040. He must have had some status in Brittany to be able to bring a force of men to support William in his invasion. His rewards would suggest that he was a significant player in the battles to establish William’s supremacy. It is possible too that he was a younger son of a Breton lord, who had the motivation to join the invading force with the prospect of land and the resources to equip his own platoon. His heir was called Meinfelin , quite probably his son. Meinfelin appears on record in 1110 and in 1125 as Sheriff of Bedfordshire and Buckinghamshire and we know that he died in 1155. We can see also at the time of Meinfelin’s death that the the land holdings inherited by his son Hamon were less scattered.